Southeastern Asset Management, the Memphis, Tennessee-based firm founded by Mason Hawkins (Trades, Portfolio) in 1975, disclosed five new positions in its fourth-quarter 2018 portfolio, which was released last week. Warning! GuruFocus has detected 2 Warning Signs with WYNN. Click here to check it out. With the goal of long-term capital growth, the firm, which manages the Longleaf Partners Funds, invests in a concentrated number of undervalued companies that have strong balance sheets and good management teams. Based on these criteria, Southeastern established positions in Wynn Resorts Ltd. (WYNN), PotlatchDeltic Corp. (PCH), DowDuPont Inc. (DWDP), Melco Resorts and Entertainment Ltd. (MLCO) and Grupo Televisa SAB (TV) during the quarter. 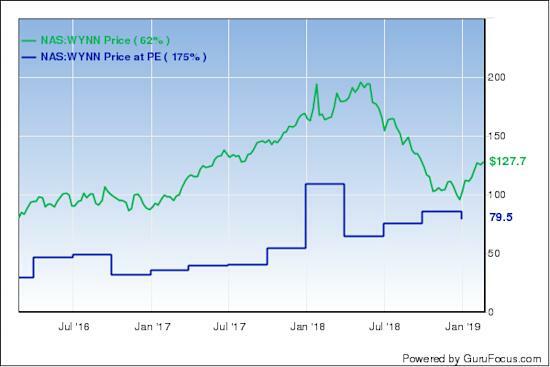 Having previously exited a position in Wynn Resorts in the first quarter of 2018, Southeastern entered a new 1.7 million-share stake for an average price of $107.35 per share. The transaction had an impact of 2.39% on the equity portfolio. The Las Vegas-based company, which owns and operates resorts and casinos, has a $14.13 billion market cap; its shares were trading around $129.96 on Friday with a price-earnings ratio of 24.52, a price-book ratio of 7.83 and a price-sales ratio of 1.99. GuruFocus rated Wynn's financial strength 4 out of 10. Weighed down by poor interest coverage, the Altman Z-Score of 1.62 warns the company is at risk of going bankrupt. The company's profitability and growth fared much better, scoring a 7 out of 10 rating. Despite seeing a decline in its operating margin over the last five years, the company is supported by solid returns that outperform competitors and a moderate Piotroski F-Score of 6, which indicates operations are stable. The company also has a business predictability rank of one out of five stars, which is on watch as a result of issuing approximately $259.02 million in new long-term debt over the last three years. GuruFocus says companies with this rank typically see their stocks gain an average of 1.1% per year. Of the gurus invested in Wynn Resorts, Steve Mandel (Trades, Portfolio) has the largest stake with 5.48% of outstanding shares. Other top guru investors are Steven Cohen (Trades, Portfolio), Lee Ainslie (Trades, Portfolio), Louis Moore Bacon (Trades, Portfolio), Mario Gabelli (Trades, Portfolio), Pioneer Investments (Trades, Portfolio), Ken Fisher (Trades, Portfolio) and Murray Stahl (Trades, Portfolio). The firm invested in 4.6 million shares of PotlatchDeltic for an average price of $35.55 per share, allocating 2.09% of the equity portfolio to the stake. The firm previously sold out of the stock in the first quarter of 2013. The real estate investment trust, which is headquartered in Spokane, Washington, also operates eight manufacturing facilities that produce lumber and panel products. 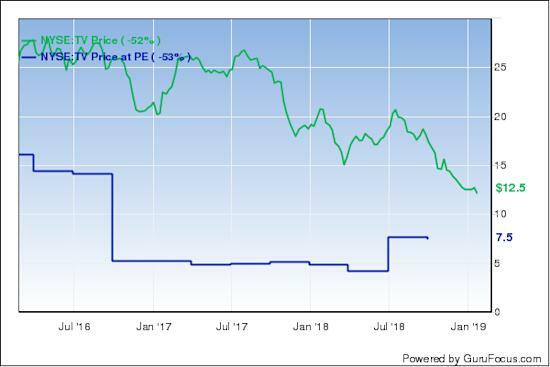 The company has a market cap of $2.49 billion; its shares were trading around $36.90 on Friday with a price-earnings ratio of 18.65, a price-book ratio of 1.91 and a price-sales ratio of 2.34. PotlatchDeltic's financial strength was rated 4 out of 10 by GuruFocus. While the company has sufficient interest coverage, the Altman Z-Score of 2.02 suggests it is under some financial pressure as a result of declining revenue per share over the last 12 months. The company's profitability and growth fared a bit better with a 6 out of 10 rating. Although the operating margin is expanding, it underperforms 78% of industry peers. The company is supported by strong returns, a moderate Piotroski F-Score of 6 and a 3.5-star business predictability rank. According to GuruFocus, companies with this rank typically see their stocks gain an average of 9.3% per year. With its purchase of 6.85% of outstanding shares, Hawkins' firm became PotlatchDeltic's largest guru shareholder. Jim Simons (Trades, Portfolio)' Renaissance Technologies, Chuck Royce (Trades, Portfolio), Fisher, NWQ Managers (Trades, Portfolio) and Pioneer also have positions in the stock. 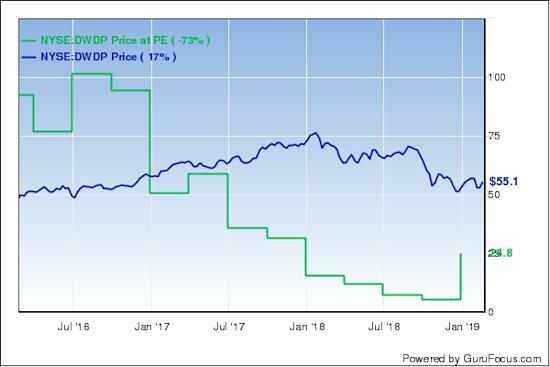 Southeastern picked up 2.4 million shares of DowDuPont for an average price of $56.47 per share, dedicating 1.85% of the equity portfolio to the stake. 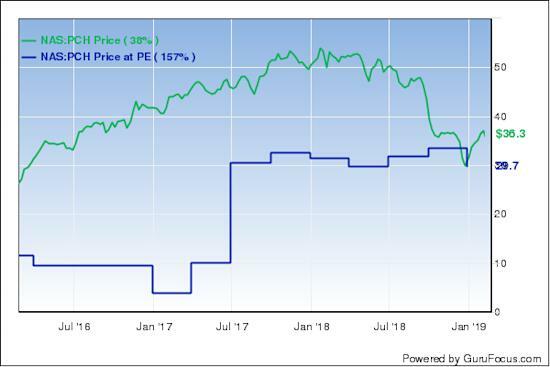 The Midland, Michigan-based chemical company has a $124.19 billion market cap; its shares were trading around $55.08 on Friday with a price-earnings ratio of 33.38, a price-book ratio of 1.32 and a price-sales ratio of 1.48. DowDuPont's financial strength and profitability and growth were both rated 6 out of 10 by GuruFocus. Despite issuing approximately $3.7 billion in new long-term debt over the last three years, it is at a manageable level as a result of adequate interest coverage. The Altman Z-Score of 1.78, however, warns the company is in danger of bankruptcy since it has recorded a decline in revenue per share over the last five years. The chemical manufacturer is supported by an expanding operating margin, a high Piotroski F-Score of 8, which suggests business conditions are healthy, and a one-star business predictability rank. Daniel Loeb (Trades, Portfolio) is the company's largest guru shareholder with 0.43% of outstanding shares. Other gurus who hold the stock include Larry Robbins (Trades, Portfolio), the T Rowe Price Equity Income Fund (Trades, Portfolio), Andreas Halvorsen (Trades, Portfolio), PRIMECAP Management (Trades, Portfolio), Ainslie, NWQ and Leon Cooperman (Trades, Portfolio). After divesting Melco from the portfolio in the first quarter, Hawkins' firm started a new 51,444-share holding for an average price of $17.75 per share. The trade expanded the equity portfolio 0.01%. Headquartered in Hong Kong, the casino and resorts operator has a market cap of $1.49 billion; its shares were trading around $23.94 on Friday with a price-earnings ratio of 32.80, a price-book ratio of 5.27 and a price-sales ratio of 2.33. Weighed down by poor interest coverage and a low Altman Z-Score of 0.80, GuruFocus rated Melco's financial strength 5 out of 10. It has also recorded a slowdown in revenue per share growth over the last 12 months. The company's profitability and growth fared much better, scoring a 7 out of 10 rating. Although the operating margin is in decline, it still outperforms 62% of competitors. The resort operator is also supported by good returns, a moderate Piotroski F-Score of 5 and a one-star business predictability rank. Of the gurus invested in Melco, Simons' firm has the largest position with 0.39% of outstanding shares. Pioneer and Cohen are also shareholders. 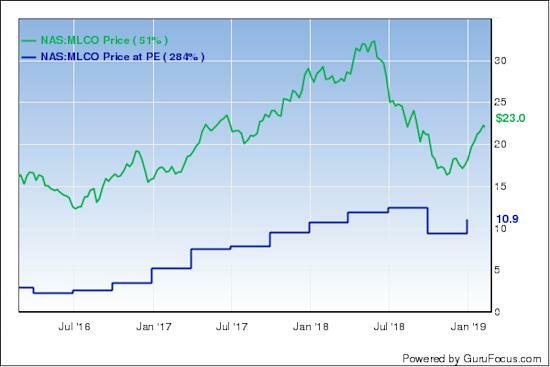 Having previously closed out of a stake in Grupo Televisa in the third quarter, Southeastern opened a new 18,330-share position for an average price of $14.56 per share. The Mexican mass media company has a $7.24 billion market cap; its shares were trading around $11.95 on Friday with a price-earnings ratio of 23.06, a price-book ratio of 1.52 and a price-sales ratio of 1.39. Grupo Televisa's financial strength was rated 5 out of 10 by GuruFocus. In addition to having poor interest coverage, the Altman Z-Score of 1.60 warns the company could potentially go bankrupt. The company's profitability and growth scored a strong 9 out of 10 rating. Although the operating margin is in decline, it still outperforms 83% of industry peers. The company also has stable returns and a high Piotroski F-Score of 7. Despite recording consistent earnings and revenue growth, the company's four-star business predictability rank is on watch. According to GuruFocus, companies with this rank typically see their stocks gain an average of 9.8% per year. With 9.44% of outstanding shares, Dodge & Cox is the company's largest guru shareholder. Other guru investors are David Herro (Trades, Portfolio), Bill Gates (Trades, Portfolio)' foundation trust, Fisher, Simons' firm, Gabelli and Jeremy Grantham (Trades, Portfolio). During the quarter, Southeastern also added to a number of positions, including General Electric Co. (GE), GCI Liberty Inc. (GLIBA), Lazard Ltd. (LAZ), Yum China Holdings Inc. (YUMC) and Affiliated Managers Group Inc. (AMG). The firm's $7.01 billion equity portfolio, which is composed on 33 stocks, is largely invested in the communication services and industrials sectors. The Longleaf Partners Fund said on its website it returned -17.98% in 2018. The S&P 500 index posted a -4.38% return over the same period.